The first domestic casters three years warranty. Box trolley equipped with ultra-quiet medical casters, Shore 50 degrees high elasticity TPR material wheel tread, not degumming, non-stick hair drop. Industrial nylon wheel frame, ten times better than steel structure, no rust, no paint. High-precision deep groove bearings, turning light, configure the innate ultra-quiet effect. 3. ABS table top is equipped with protective soft glass for easy cleaning. 4. Aluminum column support body. 5. The first domestic casters three years warranty. Box trolley equipped with ultra-quiet medical casters, Shore 50 degrees high elasticity TPR material wheel tread, not degumming, non-stick hair drop. Industrial nylon wheel frame, ten times better than steel structure, no rust, no paint. High-precision deep groove bearings, turning light, configure the innate ultra-quiet effect. 8. ABS drawer inside are equipped with free insert. 9. Infusion rack can be easily loaded and unloaded. Looking for ideal Stainless Steel Fence Treatment Cart Manufacturer & supplier ? We have a wide selection at great prices to help you get creative. All the Stainless Steel Fence Cart are quality guaranteed. 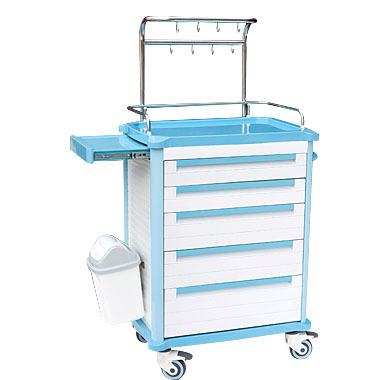 We are China Origin Factory of ABS Table Top Treatment Cart. If you have any question, please feel free to contact us.